Do ‘Death Taxes’ Affect Economic Choices of the Living? Do estate taxes make people work and save less? It’s commonly argued that they do not. After all, the argument goes, estate taxes are levied on the dead. How can they affect economic behavior among the living, especially young workers? This seems plausible. But simple economics shows it’s wrong. Let me show you why. Estate taxes are essentially one-time excise taxes on savings. As people save and invest throughout life, they do so knowing that some day their nest egg will be taxed. However, savings are really just set-asides from income. When people save, they set aside part of their income. And when they die, that saved income is taxed through the estate tax. When viewed this way, we can think of estate taxes as delayed, one-time income taxes. Once we realize estate taxes are fundamentally income taxes, it’s clear that they affect economic behavior just like other income taxes. The only real difference is that the payment due-date is delayed. Economists use this line of reasoning to measure the effect of estate taxes on work and savings decisions in the economy. By converting the estate tax into an equivalent income tax, we can get a better sense of its economic importance. Here’s the logic: People shouldn’t care whether their saved income is taxed each year though life, or once at the end of life. Using some algebra, we can figure out how big of an income tax is needed to replace the estate tax. 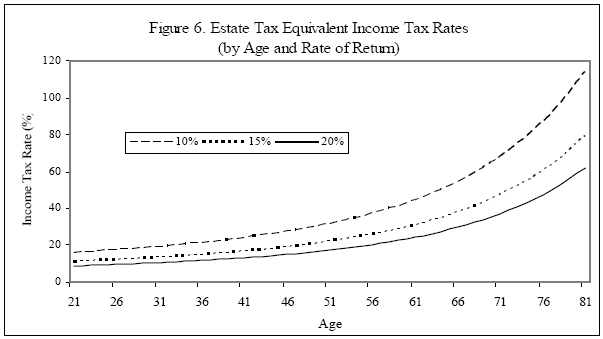 …the findings suggest that estate taxes have a dampening effect on the reported size of taxable estates. Estate taxation seems to depress taxable bequests by some 14 percent.